Josephine Falls are ranked among the most beautiful in the Tropical North Queensland, and have been used in many television commercials. They are located at the foot of the southern face of Mount Bartle Frere in the Wooroonooran National Park, in Queensland, Australia just 75 km south of Cairns. The falls are a popular recreation site among locals as the water flows over a large rock to form a natural waterslide. Visitors can swim in the crystal clear waters, and relax on the sandy beach as the gentle breeze rustles leaves high in the rainforest canopy. This image belongs to the travel and nature stock photo library. This stock photo of Josephine Falls is available for licensing for commercial and editorial uses including websites, blogs, books, magazines, brochures and advertising. Restrictions may apply for images which contain third party copyrighted material or sensitive subjects. Photos of artwork are for editorial use only. 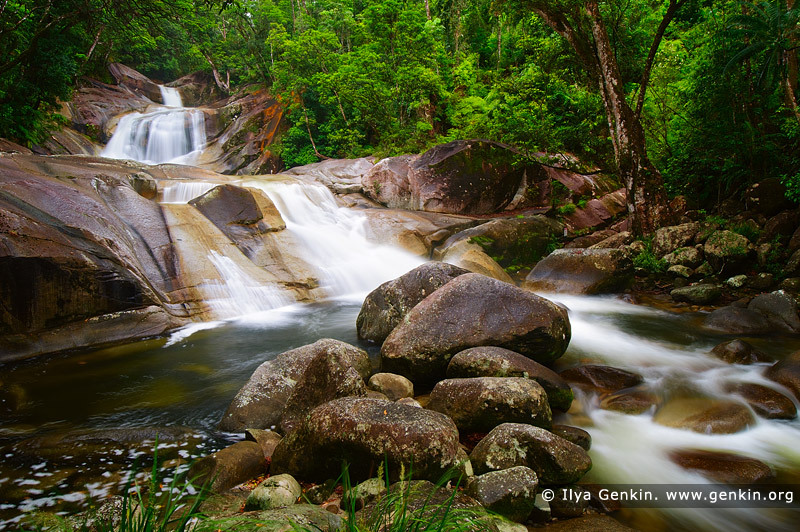 This image id QLD-JOSEPHINE-FALLS-0001 of Josephine Falls, is copyrighted © by Ilya Genkin. This is not a public domain image.